Mexico is a country with one of the oldest Mints in South and North America. Mexico’s Gold Centenarios are one of the oldest bullion coins known to the investment community with added bonus of low dealer premiums. These coins are struck of 22K metal purity with 90% gold and 10% copper and are slightly larger than standard 1 troy ounce size bullion coins from other countries, weighing in at 1.2057 oz of pure gold. Let’s take a look at the five reasons why you should not overlook them and possibly consider adding them to your investment portfolio. 1. 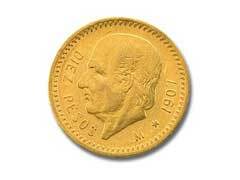 Mexican gold coins can be a valuable investment opportunity for many individuals. Mexican gold bullion may be found for less, but without sacrificing any quality in the process. These coins are popular with investors from many countries, including America. If you are investing simply for the precious metals value then these coins can be an excellent choice to round out your investment portfolio or gold coin collections. 2. The gold pesos with a value of fifty contain more than one ounce of gold in some cases, and these are valued by investors. Some of these Mexican gold coins have a historic value as well as their gold value, if they were minted before a certain date. These coins have been minted for much longer than the newer China gold coins, and they are recognized in many places. 3. Mexican gold coins can provide an inflation hedge just as well as any other types of gold bullion coin. It is the amount of the bullion that counts for this purpose, not the government which minted the coins you invest in. One ounce of yellow precious metal in a coin from Mexico has the same value for inflation protection as one ounce in an American or Australian coin. 4. Although not as well known as Krugerrand gold coins, which are recognized anywhere and are considered one of the best choices for investors, Mexican gold coins also offer many of the same benefits. These coins have almost no drawbacks, and investors may prefer these choices because the demand is not as high, so the price does not become overly inflated. 5. Mexican gold coins can increase the investment choices that you have available to you. These coins can be combined with other, like Canadian gold coins and American choices, as well as other investments for an investment portfolio which is diverse and covers all angles.